This teen possesses the drive and commitment needed to compete at a high level. Now all he needs is patience to advance his physique. Lucky for Tom, time is on his side! At first, I was addicted to lifting and started to further myself by taking a personal training certification course. In the class, I met someone who became a good, long-time friend who was preparing for his first bodybuilding show. I was 16 years old when that friend showed me a Kai Greene motivational video. It sent shivers down my spine and I decided to compete. I fell in love with every aspect of bodybuilding at my first competition; the distinct aroma of dream tan, hot stage lights, and poses. Prior to the show, I was anxious about the lack of clothing I was expected wear. When I stepped on stage and saw the lights blaring onto the black backdrop with trophies standing as high as my thighs lining the curtains, nothing else mattered. I was suddenly absorbed by the underground bodybuilding world. Most people say my diet is "boring" and "repetitive." I prefer to stick to the basics with easy-to-measure foods and aim to eat every three hours. Right now, my carbohydrates are low because I'm getting ready for competition. Carbs vary depending on my weight and competition dates. In the off-season, I try to keep a clean diet, but eat more. I always aim to get better because it helps me focus in all aspects of life. I don't like to skip days or mess around because I have built up energy that I need to expel. I don't have the best genetics so I can't afford to waste time. Unlike other sports, competitions are the fun part. Nearly all the work is done in preparation, which allows me to relax and perform with intensity. I love the extreme attention to detail from counting macros to making sure each arm has an even workout. I'm not a fitness guru. I'm an enthusiast. I stand behind the idea that anything can be helped by exercise and a good diet. I enjoy connecting my body and mind. My initial motivation was Kai Greene (maybe I'll meet him one day). On days I feel tired or lazy, I go to YouTube. I'm at the point where I just go to the gym. I look forward to my workout. Now my motivation source is nearly all intrinsic. If I keep improving at the rate I am now, I believe I can win not just my class, but the overall at a regional show. As for now, I compete in the INBF and OCB, but will soon switch to NPC. I plan to compete for a long time and want to join the big guys in the IFBB. I will be an entrepreneur and own a gym to satisfy the needs of "iron-lovers" (no rubber weights or clunk alarms). To be a successful bodybuilder, you must train hard, be patient, enjoy every minute, and don't give up. I notice rough spots in competing, and it's hard to keep going, but I always keep the desire to be the best. I will always want to be better than the guy standing beside me. No negativity can take that desire from me. If I had to choose a favorite competitor, it would be Ryan Doris, IFPA natural pro, and Kai Greene. These men reflect the idea, in my words, "shut up and fight for what you want." 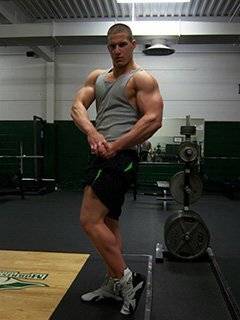 Bodybuilding.com helped by providing top-notch supplements and service cheaper than anywhere else. Other than free samples every time I place an order, I love Bodybuilding.com for providing a live stream of the Olympia. If it weren't for them, I would never see the best bodybuilders in the world at their peak.